The year is 2052 and the global ship, Sarcups, has just experienced a change in command. Thrust into the position of commanding the vessel after a mysterious loss of its high-ranking officers, Commander Craig Scott of the Laundry Corps struggles to maintain order and routine. Scott is challenged by a less-than-competent crew of fellow laundry staff obsessed with cleanliness and good coffee, a short cranky alien who can’t speak English, and Scott’s own myopic view of what it takes to run a space vessel and its crew. 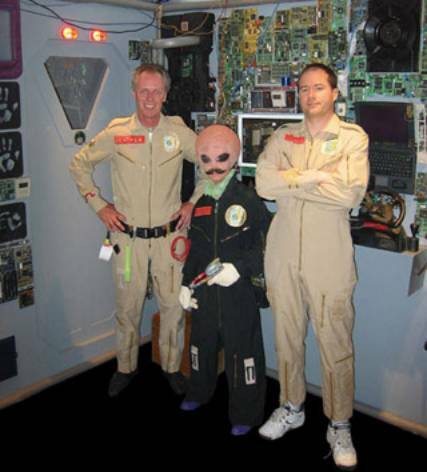 Mike Roberds as Dr. Patsey, Craig Bowlsby as Commander Craig and Linden Banks as Chief Blather. When I was first introduced to this Vancouver produced science fiction comedy by Cyrano Productions, I braced for something less than stellar. I was delightfully surprised. And I have seldom laughed so hard. It might have been my initial low expectation; I don’t think so. First of all, there is the unique and charmingly wacky premise of ‘incompetents’ from the laundry corps suddenly charged with running a space ship in its discovery mission. Premise is followed by innovative and original material, well and convincingly delivered. Add to that a cast of eccentric characters competently played by accomplished actors dispensing witty dialogue and hilarious use of metaphor, and you have a show worth watching. The metaphoric theme of laundry runs throughout the show as the newly instated commander begins his report to home base. Commander Scott (Craig Bowlsby) explains that he now has command due to a succession of previous commanders having each succumbed to the “Stimulator” at maximum setting. As Scott reassures home base that the mission to “seek out habitable planets…and, of course, long term coffee markets” is not compromised, he openly wonders why each previous commander would have willingly ended his life in the “Stimulator.” But we soon realize from the current commander’s own behaviour and those of crew members we are introduced to, that there may be good reason for such desperation. Consider, for instance, Scott’s newly appointed second-in-command, Chief Petty Officer Blather (played by Vancouver actor Linden Banks), whose answer to everything is soap. When instructed by Scott to monitor life support and engine functions for abnormalities then clean up any problems causing electrical shorts, Blather’s answer is industrial solvent 24B—with devastating consequences. Scott is not far behind. His strategy for achieving crew moral is laundry: “…as laundry goes, so goes moral. So much can be dependent on a few grams of extra soft…or crisp. It’s all in the balance. All ninety-seven members of the crew have a medium level of moral and a 90% clean garment efficiency rate,” he blithely announces. When the nameless alien (called simply the Albanian) sabotages the ship, this precipitates the feared services of the fierce gun-toting “Exterminator” (played by Tiffany Timms), who we discover is actually the ship’s librarian. 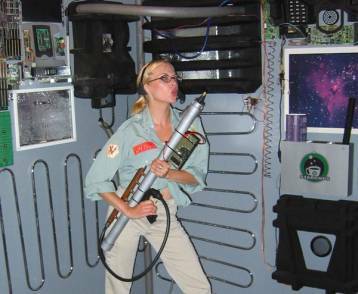 She’s taken on a personal mission to hunt down “bugs” in the system by indiscriminately blasting circuitry. One begins to appreciate the desperation with which the previous commanders of the Starcops took solace in the “Stimulator”. And, if that isn’t enough, we also learn that Starcops Coffee, purportedly the very best in the galaxy, (touted as the “blend that’s out of this world”) tastes like mud. Despite this comedy of errors, which includes the disappearance and accidental detonation of a nuclear bomb, the crew manage well enough; in several cases, ironically, due to their expertise with laundry and soap. 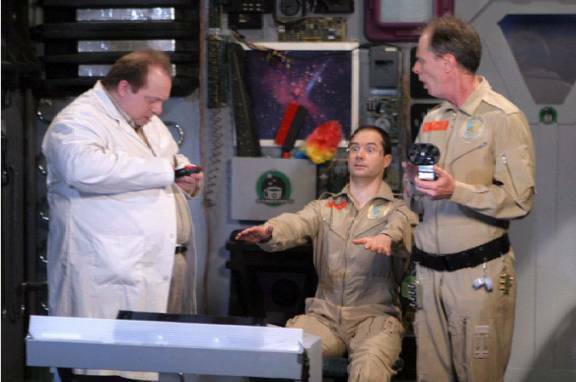 The idea for Commander’s Log was originally conceived by actor/writer/producer Craig Bowlsby as a show for the internet but it soon became more ambitious and developed into its current eight half-hour episodes. The majority of Commander’s Log takes place in the command centre of the ship, and mostly in the form of daily reports made by Commander Scott. While this was obviously a way to curb production cost (use of a single set, resembling a one-act play), the strategy worked effectively for Bowlsby, who took the challenge and channelled it into an effective platform for his unique humour. Commander’s Log mixes intelligent satire with gut slapstick and bathroom humour into a delightfully palatable cocktail. It is a charming blend of wit, nerve and silliness that soars on wings of fanciful absurdity. Sometimes a little too cute, (e.g., with names of main characters like Laundry Chief Blather, and Lieutenant Commander Bastaard, played by Greg Anderson of Stargate), the show nevertheless delivers good entertainment. Bowlsby, the show’s creator and lead actor describes the show’s humour as “multi-layered” from the obvious joke, to wry and subtle sub-text, often making clever use of cliché to achieve yet another often surprising layer. If there is a negative in all this, it would be that the humour tends to be too clever and erudite at times; perhaps a Canadian trait. The audience may also perceive the set and milieu as rather quaint and unsophisticated by current SF TV show standards; yet it has its own charm. Bowlsby reserves his production costs for quality acting and delivering a good script and story. Bowlsby shared script-writing with Catherine Girczyc (The Collector, Dead Man’s Gun). And in several episodes we are treated to some dazzling moments care of NorthWest Imaging, the creators of the award winning effects of Andromeda. The tag line for the DVD of the Premiere episode of Commander’s Log runs: “In space, no one can hear you do the laundry.” The clever play on words is also, unfortunately an apt metaphor to the legacy of the show on Space Channel (pardon the awful pun). Commander’s Log sporadically aired on the Canadian Space Channel in 2005 and not at any specific time or in any particular order. Running Commander’s Log out of sequence was potentially devastating to its success and certainly increased “the weirdness factor” according to Bowlsby. Imagine your favourite comedy movie where the last scene with the punch line is shown before its set up scene. Any chance of gaining genuine interest from a TV audience accustomed to routine and being told when to laugh would be slim indeed under such circumstances. Despite its shortcomings, Commander’s Log charms, evokes bouts of belly-laughs, and entertains. It deserves a proper run on network television for providing something genuinely new, refreshing and quirky. If Commander’s Log makes it to your local SF network, check it out, but chances are it will be shown out of order or not in its entirety. You may be better off purchasing the DVD set. Original review in Neo-opsis # 12.